1. Paint your paper plate green (eating side down). While you're waiting for it to dry, trace and cut out hand prints. Glue onto the back of the paper plate on either side. 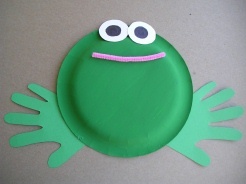 Click here to find more Frog Crafts like the Paper Plate Frog!